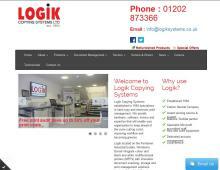 Logik Copying Systems is a supplier of all in one printers in Dorset. It specialises in hard copy and electronic print management using the latest technologies. This specialist supplier of MFPs and photocopiers in Ferndown are a Toshiba mainline company providing printer services across the surrounding areas of Dorset, Hampshire and Wiltshire. Logik Copying Systems can provide black and white or colour multi functional printers (MFPs); refurbished photocopiers; desktop photocopiers; lease or photocopier rental; and print management solutions such as Papercut mf. Logik Systems are a highly established business with award winning printer service and support contracts. The Poole copiers was established in 1994 and offers a dedicated service to its clients providing a great range of photocopiers, office printers and network printers. Logik also has the expertise to advise different business sectors. For example, the best legal size copier printer scanner for solicitors or the best photocopiers for schools to keep printing budgets down. Logik are currently looking at expanding their customer base through merger or acquisition, so if you have a copier business for sale contact Rob at Logic Systems to discuss this opportunity in strict confidence.